Hawaii, also known historically as the Sandwich Islands, is composed of 19 islands and atolls forming the Hawaiian Archipelago. The chain owes its existence to intense volcanic activity over thousands of years, and today is the only state continuing to grow because of lava flows. 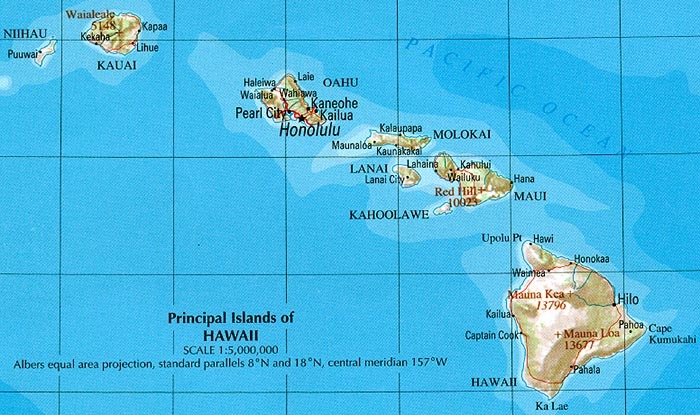 Hawaii also represents the southern most point in the U.S., and the only state which is entirely tropical. It is believed that the first inhabitants of the Hawaiian Islands were Polynesians who arrived around 300 AD. Some one thousand years later Tahitian settlers conquered the island and wiped out the original inhabitants. Though there are sketchy reports of earlier sightings and explorations, Captain James Cook is generally regarded as the first European explorer to set foot on Hawaii (as well as the first European explorer to die on it) in 1778. Between 1795 and 1810, Hawaii began to unify under one Kingdom, led by the skillful leader Kamehameha the Great. 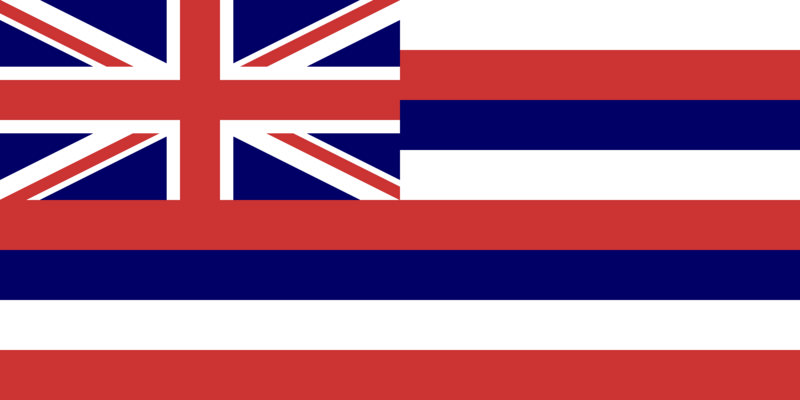 The Hawaiian Kingdom did not last long however, and after effectively sidelining the Monarchy with the Bayonet Constitution in 1887, Hawaii was incorporated into the United States as a territory on June 15th 1898, and received full-fledged statehood a half a century later in 1959, becoming the 50th and last state in the Union. Hawaii is the only state in the U.S. where the majority population is non-white, and is also home to the largest percentage Asian-Americans in the United States at 41.6% according to the 2000 Census. The largest industry by far is tourism, contributing just under a quarter of the total Gross State Product. Hawaii's lush flora and indigenous wildlife are major tourist attractions, though the threat to these species has earned Hawaii the dubious moniker of 'the endangered species capital of the United States'. Hawaiians have one of the largest tax burdens in the country due to the fact that many services are administered directly by the state, as opposed to municipal administration in other U.S. states. O'ahu, at over a million people, is the most populous island and home to the largest city and capital Honolulu, which itself is considered the 'most international city in the United States'. Hawaii is predominately a Democratic state, sending its 4 electoral votes to the last 5 Democratic Presidential candidates. A total of two seats are reserved in the House of Representatives for Hawaii. The state also had the lowest voter turnout in the 2004 presidential election.